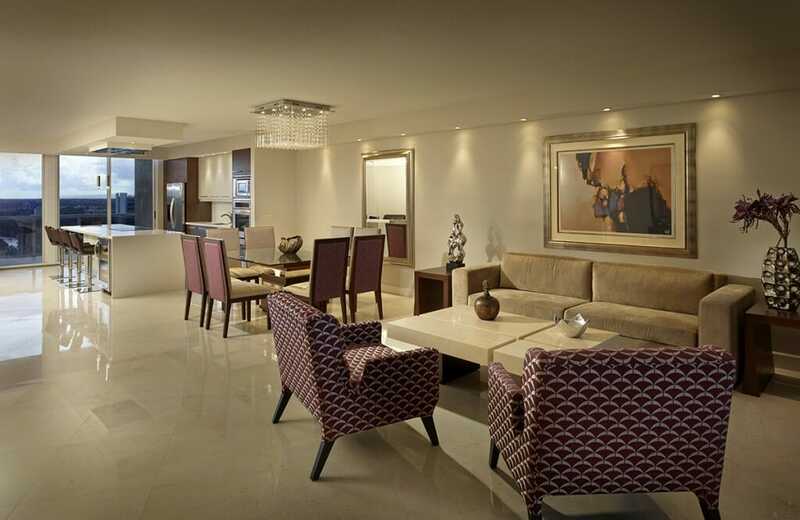 “Interior design is far more than an expression of taste. It’s an expression of life.” -Emily A.
Passionate about interior design since her youth, Decorilla interior designer, Emily Arnez, has extensive experience in working on high-end residential and custom millwork designs in the Miami, Florida area. Her projects combine artistic interpretation and functionality. This brings spaces to their full vitality. 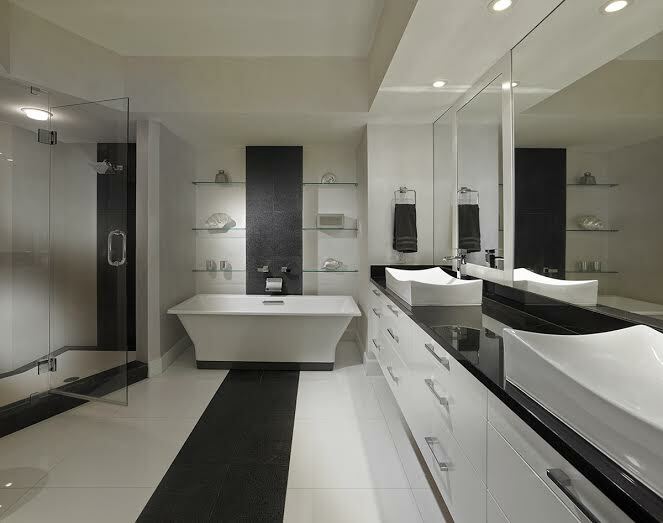 “As life, interior design is full of light and shadow, energy and form, the yin and the yang. It’s a personal intimate statement.” With a recent successful Airbnb design installation at Art Basel Miami added to her portfolio, we delve deeper into Emily’s love of design in this month’s Decorilla Interior Designer Spotlight. I’ve always had a love for art and architecture. I’ve always been an artistic and creative person, but what really grew my interest in design was when I started interning for designers and saw how people were able to solve problems through visual means and I knew that this was my path. 2. How would you define your design style? My style is transitional with an eclectic global edge. I love a classic aesthetic, executed in a fresh, contemporary chic way. I love mixing traditional and modern; it’s more fluid than modern and cleaner than traditional and I aim to infuse every project with a unique piece from around the world to create a unique result. My travels and experiencing new cultures, landscapes, people, architecture, and art have left the most influence on my designs. 4. How was your recent experience working on an Airbnb design? It was fun, and kept me on my toes. The home was beautiful and had a lot of character, the backyard featured a gorgeous pool surrounded by areca palms. 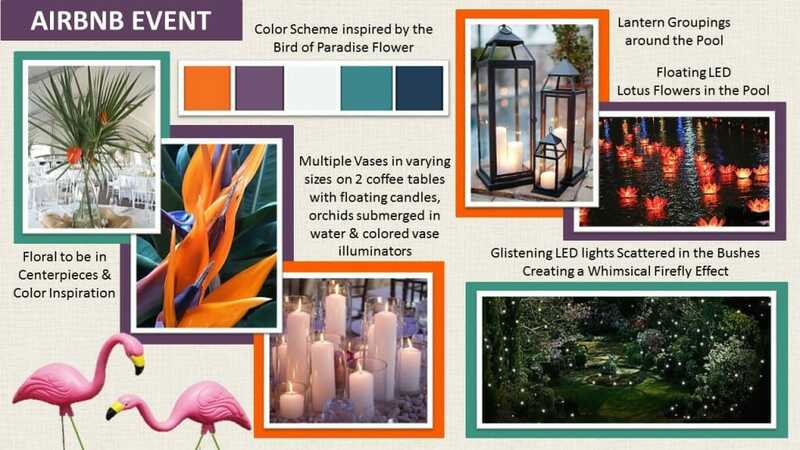 My original concept was to utilize the outdoors and create a tropical oasis letting the lush plantings speak for themselves accenting with romantic lanterns, brightly colored pillows, orchids, candles, and soft glowing lights in shades of white and pink. Unfortunately, South Florida had another plan in mind and it rained the entire day and continued to drizzle into the night. 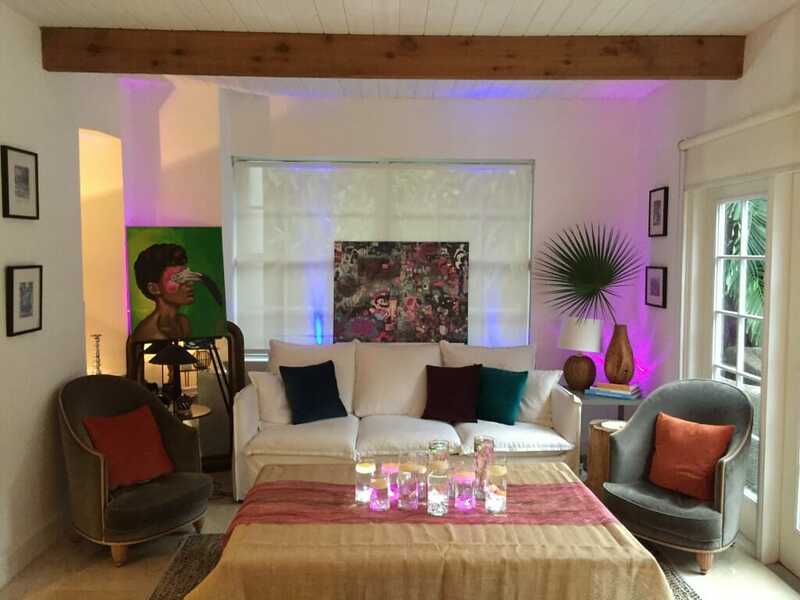 Luckily the interior was fresh, with comfortable furniture, and had an inviting atmosphere so that we could bring the party inside and accent the rooms with the original selections to keep the tropical oasis theme alive inside. 5. Is there one thing you always include in your designs? 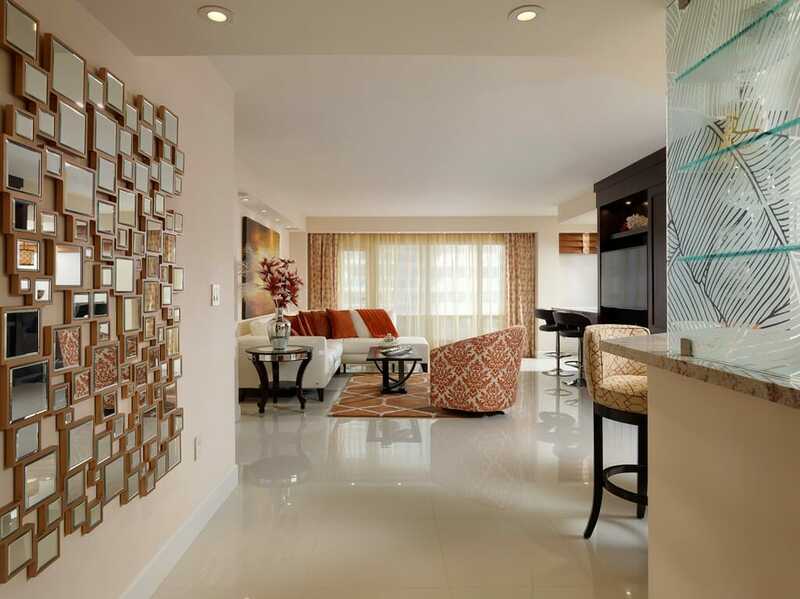 No design is ever the same; each interior design is a reflection of the individual’s character and personality. Based on their influence/inspiration I love to hunt for perfect unique pieces/accents to express their individuality. I love combining pieces from all over especially from small artisan companies. 6. What current trend do you think we’ll be so tired of in five years? What current trend do you love? All white everything. White washed wood floors, white sofa, white chairs, white fireplace, etc… with pops of colorful accents. Yes it is clean and relaxing but will not stand the test of time long term. I currently love warm metallics and whimsical lamps, pendant, and chandeliers. 7. If you had to pick a favorite room in your home, which would it be and why? My living room; it has a comfortable relaxed intimate feel, with globally infused décor, jewel tone accents, subtle layers of textures and patterns, rich dark brown furniture, and flickering candles all over really set the tone for a perfect evening to lounge around with close friends over a glass of wine. 8. What is your favorite design magazine or blog and why? Elle Décor. They feature beautiful homes, great designers, articles, and trends. 9. What is the best thing about being an interior designer? 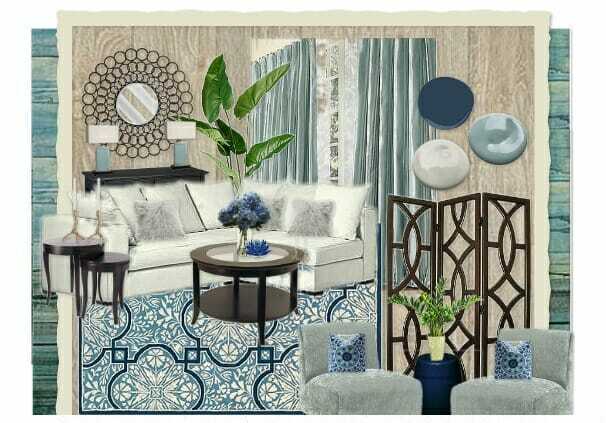 Bringing out my creativity is the best part about being an interior designer. I have a strong eye for design and experience life visually by taking in all the elements that create our world: colors, shapes, forms, materials, etc. So with each new client it is a new experience, a new vision, a new inspiration that I am able to express my creativity through and find creative solutions to interesting problems. 10. What was your first big project and what was your favorite part? Designing a five bedroom house off of Florida’s inter coastal from the ground up. My favorite part was working alongside a very prestigious architect designing everything from the floor plan to the ceiling designs. 11. How do you manage challenges that come up during a design project? I keep a running list of what needs to be completed, so when there is a curveball thrown my way I prioritize my day’s task/list ensuring that things are completed on time or not forgotten while I am attending to the challenge the day brings, making sure nothing goes unnoticed . There is never a dull moment which keeps my day fresh and exciting. For more examples of Emily’s work, check out her interior designer portfolio on Decorilla.